Sales are rising fast as it buys up other retailers, but its chief competitor is innovating, too. HOBOKEN, N.J. — Even after an online spending spree, it may be hard for Wal-Mart to escape the Amazon in the room. Wal-Mart’s acquisition of Jet.com and brands that appeal to younger shoppers have given it an e-commerce boost as it works to close the gap between itself and the online leader. The world’s largest retailer is betting on essentials like cereal and diapers, and has adjusted its shipping strategy to better compete with Amazon’s Prime program. But Amazon keeps innovating too, implementing new technology and trying to make shopping more convenient. Marc Lore, a co-founder of Jet.com who is now head of Wal-Mart’s U.S. online operations, says he’s confident about the company’s momentum and that there’s plenty of room for it to thrive. “I can tell you we are happy with the moves we are making, and we are happy with the results,” Lore said at Jet headquarters in Hoboken, New Jersey. “It’s about moving fast. It’s about innovating. And it’s a very big market.” He noted that e-commerce sales industrywide are still growing 15 percent per year. Lore led Wal-Mart’s acquisitions of specialty online retailers such as ModCloth, Moosejaw and ShoeBuy.com, and said he’s still looking at companies that have expertise in categories where Wal-Mart wants to grow faster. As Wal-Mart prepares to show off some of its innovations this week before its shareholder meeting, there are signs that things are starting to click. Sales at Walmart.com rose 63 percent in the first quarter, up from 29 percent growth in the previous quarter and marking its fourth straight quarter of increases. Wal-Mart said most of the increase was not through acquisitions but was fueled by changes in its shipping strategy and a discount for shoppers who pick up their online orders. Walmart.com now offers 50 million products including those from third-party sellers, up from 10 million a year ago. In comparison, Amazon has hundreds of millions of products. David Spitz, CEO of e-commerce technology company ChannelAdvisor, says for some shoppers it has become ingrained that they start and finish their shopping at Amazon, and the Prime program reinforces that. He said Wal-Mart wasn’t putting a sufficient emphasis on keeping up. Amazon accounted for 33 percent of U.S. online sales last year, according to the research firm Euromonitor. 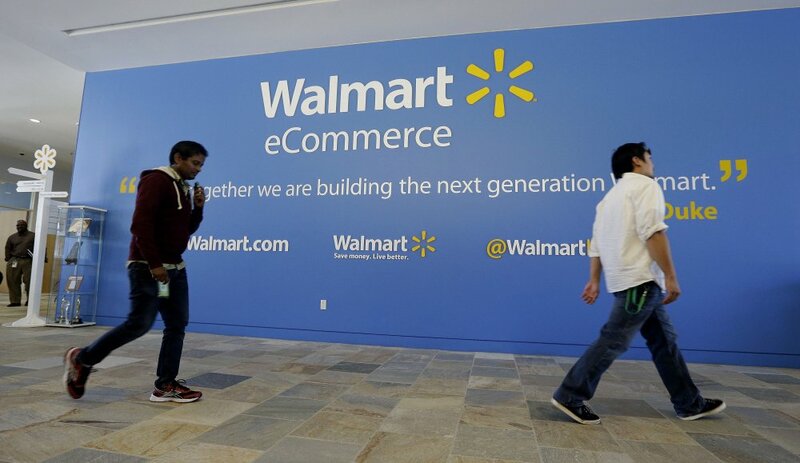 Wal-Mart moved into second place ahead of eBay, with 7.8 percent. Greg Melich, an analyst at research firm Evercore, estimates that Amazon customers spend an average of $800 annually on the site, and members of its $99-a-year Prime program spend on average 2.7 times more than others. Its 4,700 stores are a strength for Wal-Mart because they buck the larger retail trend in seeing increases in shopper numbers and sales. The discount for store pickup is helping bring shoppers in. Wal-Mart says the expansion of stores with curbside pickup for groceries is also helping, since people often realize they forgot an item or two and run into the store. Amazon’s stores are mainly showcases for gadgets, or are textbook- and furniture-pickup locations aimed at college students. But Amazon keeps innovating. It’s testing an Amazon Go convenience store, where sensors track items as shoppers go and there’s no need to check out. Amazon also launched two grocery pickup kiosks in Seattle that allow Prime customers to buy fresh items online and pick them up in as little as 15 minutes instead of having them delivered. The service is free, and there’s no order minimum.